A hunt has been launched for a red panda which has gone missing from a zoo in Belfast. Police in Northern Ireland said the animal had disappeared on Sunday and was believed to be hiding in nearby Glengormley. The public has been urged to keep clear of the mammal as it ‘may be defensive when cornered’. Two panda cubs were born to parents called Chris and Vixen at the zoo last year, but it is not clear if either of those is the animal that has gone missing. Police said in a statement: ‘Earlier today a red panda decided to take a surprise vacation from Belfast zoo, it is believed to be currently taking the sights of beautiful Glengormley. ‘Should you see this panda, please ring us on 101, the PSNI along with help from our friends at the zoo will help transport the explorer home. These animals are nocturnal and would generally be located within wooded areas. ‘Please do not approach or attempt to capture this animal, although they are not aggressive by nature they may be defensive when cornered. Two twin red pandas – not related to giant pandas – were born at the zoo in June last year to parents Chris and Vixen. Chris came from Beekse Bergen Safari Park in the Netherlands in 2013 while Vixen arrived from Germany’s Dresden Zoo in April 2017. A female red panda called Plocia also gave birth to a cub at the zoo in 2014. It is not clear which animal has vanished. In June last year a spider monkey which escaped from the zoo was hit and killed by a car on a nearby motorway. It is also not the first time a red panda has escaped from Belfast Zoo, after one of the animals disappeared from an enclosure in 2002. The zoo is closed this week for maintenance works and will not be open to visitors on Monday. According to zookeepers the red pandas are also known as ‘lesser’ pandas or ‘firefoxes’. It was originally thought they were was related to the raccoon family or even the other bamboo eater, the giant panda, but they have since been classified as a unique species in their own family, the zoo said. 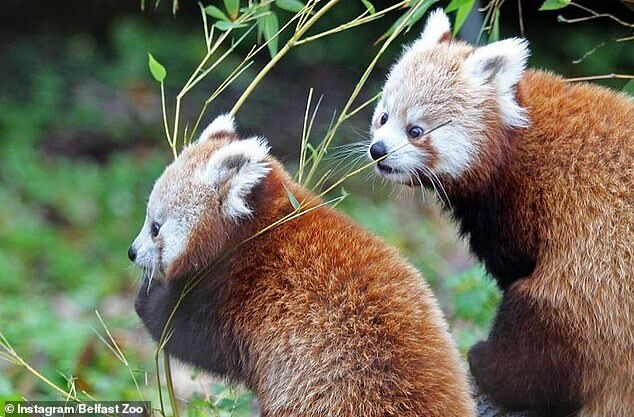 Red pandas eat mainly bamboo but will also consume berries, blossoms, bird eggs and even small birds. The mammals spend most of their time in the trees, with sharp claws which make them agile climbers, according to zoo chiefs. 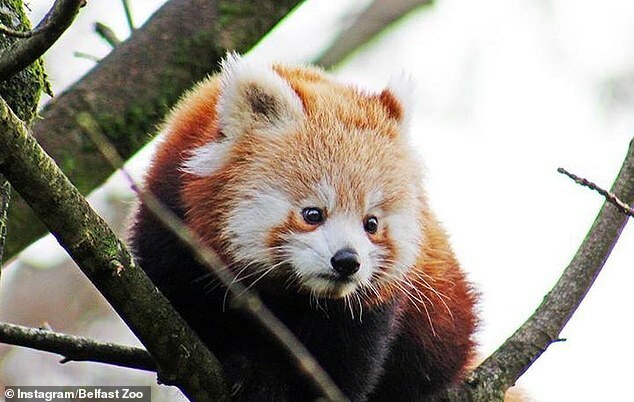 Zoo manager Alyn Cairns said at the time of the twins’ birth: ‘Red panda are native to the Himalayas in Bhutan, Southern China, Pakistan, India, Laos, Nepal and Burma. ‘However, red panda numbers are declining dramatically due to habitat loss and illegal hunting for their fur, in particular their long bushy tail which is highly prized as a good luck charm for Chinese newlyweds. There are believed to be under 10,000 red pandas left in existence, according to the World Wildlife Fund, with around 750 in zoos around the world.